It sure is a river bottom. It has been a river bottom since the end of the last Ice Age. Or longer. Matter of fact one can find the ancient meanders of the river inside the floodplain where the man made current channel resides. Interesting discussion. I would have been all for the amenities and extravagances originally proposed if you had asked me a year ago. Now with all the delays, expense and possibility of having to reconstruct the features every so often after a flood, I am for a more natural looking and feeling Trinity River as it meanders by DTD. I had a hard time imagining how attractive a meandering, narrow river with grassy fields and the occasional stand of trees would be appealing. But having come from a trip to the Rockies ( Vail, Avon, Edwards specifically) I think this is by far the best solution. The Colorado River and it's tributary streams were SO LOVELY and appealing as they wound their way through the fields at the foothills of the mountains. It would seem "naturalizing" the Trinity would be the most eco-friendly, cost efficient and quickest way to get our dream park. Bring back a more natural course, add groves of trees where aesthetically pleasing and let the bottoms grow without mowing and landscaping- perfect! Granted, there won't be a Rocky Mountain backdrop- but a Dallas skyline is hard to beat too. NdoorTX wrote: Interesting discussion. I would have been all for the amenities and extravagances originally proposed if you had asked me a year ago. Now with all the delays, expense and possibility of having to reconstruct the features every so often after a flood, I am for a more natural looking and feeling Trinity River as it meanders by DTD. I had a hard time imagining how attractive a meandering, narrow river with grassy fields and the occasional stand of trees would be appealing. But having come from a trip to the Rockies ( Vail, Avon, Edwards specifically) I think this is by far the best solution. The Colorado River and it's tributary streams were SO LOVELY and appealing as they wound their way through the fields at the foothills of the mountains. It would seem "naturalizing" the Trinity would be the most eco-friendly, cost efficient and quickest way to get our dream park. Bring back a more natural course, add groves of trees where aesthetically pleasing and let the bottoms grow without mowing and landscaping- perfect! Granted, there won't be a Rocky Mountain backdrop- but a Dallas skyline is hard to beat too. Very nice, could not have said it better. Though the more I think about it just pulling a lady bird is doable and those embankments make it actually not that hard to pull off, again we are talking a shallow lake, nothing you can take your speed boat out on. I mean these proposals actually wouldnt be hard to pull off (the development aside), and with the tollroad gone that gives even more room and makes them cheaper to pull off. Its sort of odd that at the heart of it, simply building simple lakes and planting some trees are what the actual use of the Trinity is for these projects once you look past the now dead tollway and the development on the river banks...and they are the cheaper options. Replace the tollway with a boardwalk. Build lakes and plant trees. Call it a day. We'd be good with that. I like how everyone has the instant solution because we are all frustrated with a lack of any plan actually moving forward except the bridges. Keep in mind everyone with your "visioning" the Army Corp of Engineers has a lot of NO's when it comes to what can be done between the levees and to the levees. No plant life except grass on the levees, mowing is a requirement according to the last I checked between the levees. Also, they have to approve of any new trees to be planted inside the flood zone in case they negatively affect the flow of water and/or safety. The Army Corp of Engineers primary goal is to make sure the tons of water that fills those levees several times a year doesn't flood Downtown and become Katrina part deux Dallas Edition. All the other stuff people have being fantasizing about is just kids stuff. cowboyeagle05 wrote: I like how everyone has the instant solution because we are all frustrated with a lack of any plan actually moving forward except the bridges. Keep in mind everyone with your "visioning" the Army Corp of Engineers has a lot of NO's when it comes to what can be done between the levees and to the levees. No plant life except grass on the levees, mowing is a requirement according to the last I checked between the levees. Also, they have to approve of any new trees to be planted inside the flood zone in case they negatively affect the flow of water and/or safety. The Army Corp of Engineers primary goal is to make sure the tons of water that fills those levees several times a year doesn't flood Downtown and become Katrina part deux Dallas Edition. All the other stuff people have being fantasizing about is just kids stuff. It's free to dream bro. Just to be clear... The Corps of Engineers plan for the trinity river requires hundreds of acres of forested wetlands to be planted within the floodway. The purpose is to filter the water, prevent erosion, capture nutrients, support habitat, and manage river flow speeds. There's never been a plan to build lakes. The so-called lakes were what we in Texas call stock ponds. Say "lake" and people think White Rock. In actuality all the proposed ponds total about 1/3 the size of Bachman. Combined. Puddles with delusions of grandeur. Because of the underlying sand they could only be a few feet deep. Oh, and they had to be a large distance away from the river so that floods wouldn't erode the land between and merge them into the river, and a large distance away from any of the bridges to they didn't jeopardize their pier. Oh, and they were to be filled with piped in water because the Trinity water is too polluted. Hannibal Lecter wrote: Ah, the mythical lakes. Well, technically the corps' approved plan has the three main lakes with a combined total of 256 acres of 'open water' (12-18 feet deep), compared to Bachman lake's 205 acres (less than 14 feet deep). That doesn't include the adjacent 'wetlands'. None of these particular 'lakes' are sizable anyway. "The Trinity River lakes were never going to be humongous. Seventy-five or 80 acres each, according to the Balanced Vision Plan developed for the Trinity River Corridor Project in 2003. But now the plans have been reduced to something so small -- a couple of 20-acre ponds reaching a depth of 10 feet -- it's fair to wonder if it's even worth building." Email I got this morning. If you haven't noticed the new way forward is a public equity campaign to finally actually talk to the community on what they want to see and have regular events in the park as it is already. Bike rides, picnics etc. Brent Brown from The City Design Studio and Bc Workshop is spearheading things so it's not surprising his management of the project is a little more on the ground level than previous top-down efforts. I plan to attend these meetings if I can make it. I Prolly will never call it Harold Simmons Park. If nothing else we need to build this park just for all the instagram photo opportunities. Tivo_Kenevil wrote: I Prolly will never call it Harold Simmons Park. How can an area be called a "park" when it is not governed by the Park Board. The Dallas City Charter has this outlined very clearly. Well, technically the corps' approved plan has the three main lakes with a combined total of 256 acres of 'open water' (12-18 feet deep), compared to Bachman lake's 205 acres (less than 14 feet deep). None of the lakes in north Texas are particularly deep either. Lavon's max depth is 60 feet, average depth is closer to 20. Ray Hubbard's max depth is only 40 feet. White Rock Lake's max depth is 20 feet. TX Parks and Wildlife says Lake Bachman's max depth is 14 feet. Do they really care about public input or is this just an exercise to make us think they care about it? Tnexster wrote: Do they really care about public input or is this just an exercise to make us think they care about it? Brent Brown who is in charge of the private group now charged with developing plans does care. He ran the City Design Studio and Better Block both of which are authentic organizations which tend to be void of too much political wrangling. Better Blocks main skill has been their authenticity and ability to work with the public and gather input. This will def be a challenge for him as it has so many demons in the closet and business leaders who will want him to go one way vs what the public wants. In the end it will come down to the money. If Brent Brown cannot raise the funds to build the park he will design based on public input then it won't matter how much he cares or that he worked hard to get a public consensus. So since those meetings have started taking place, have we heard any rumblings or updates about this project? Just dumping more taxpayer dollars into a drainage ditch. Anything they do will be destroyed by the first spring flood. I'm not so sure that either of those statements will come to be true. 1. The park is being built with privately raised funds. 2. The article makes it sound like the designers and engineers on the project are very much aware of the fact that this is a floodplain and have very consciously designed the park to work with the floods. This park has massive potential and will be a complete game changer once it's finished. The Trinity Park Conservancy is hosting at first look at the park tomorrow from 5:30-8:00 at Gilley's Dallas, which should be really interesting. Just like the Cowboys season, I'm too beat-down by a generation of losing to get excited by what seems like the right plan for this public wilderness! I will skeptically wait to see the rest of it, especially how the levee-filling choke point at the standing wave entrance to the forest will be corrected. tamtagon wrote: Just like the Cowboys season, I'm too beat-down by a generation of losing to get excited by what seems like the right plan for this public wilderness! I will skeptically wait to see the rest of it, especially how the levee-filling choke point at the standing wave entrance to the forest will be corrected. this is absolutely fantastic news. I can't wait to see what it looks like. 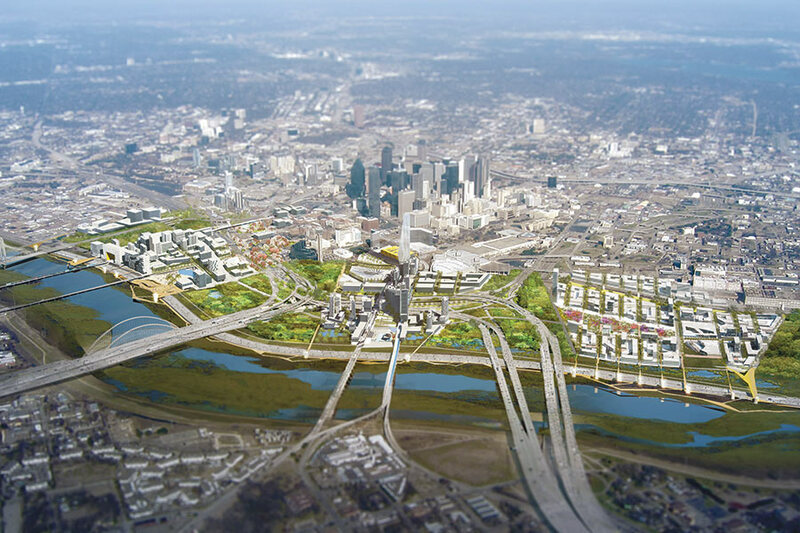 This project will absolutely be transformative for Dallas and make the city so much prettier. with this complete by 2022 if they hit their targeted date...i wonder what will happen south of the Margaret McDermott bridge in addition to the water gardens going in there and the Texas Eye project and redevelopment, and if the park could simply be extended etc. I bet in the next decade those banks of the river will start to be filled with development that will make Dallas unrecognizable in 20 years...in a great way....when combined with the existing projects happening in the Cedars, the high speed rail station, water gardens and everything else. The plan looks great to me! For once we seem to have a realistic project with a realistic timeline, so I'm a bit more optimistic than usual. I'm really liking the sound of this. I'm assuming that the potential playgrounds, cafes, and other amenities are not a part of the initial project, and they are just talking about possibilities that other developers can provide? Last edited by DPatel304 on 06 Dec 2018 21:26, edited 1 time in total. Totally unrealistic timeline given the need for permitting and review. Did anyone attend the reveal last night? I was hoping there would be more information released after it, but I'm not seeing anything. If anyone has better pictures than the DMN article, that would be much appreciated. It's hard to gauge what exactly is planned from what's been shown so far. It just looks like one cross section of one specific place. This gives a good summary of last night's event. Thanks for the article. Random question, but is there any specific reason why, when talking about the park, the boundaries are always in between the Pedestrian Bridge and I-30? I'm just curious. I realize even just that portion is massive and turning it into a park is a huge project, but further up north the park borders the Design District and further south you hit the Cedars as well as the upcoming Water Garden and Texas Odyssey projects. I think it's about limiting the size to contain the budget and achievability. We have long planned to redevelop the Trinity from top to bottom from Irving to almost I-20 depending on which design you look at from the past and the budget gets bigger every time. Now we have almost no public money to use and nothing to show for it and its long been held back by trying to do too much. Here they want to get something started by 2020 and are asking to raise 100 million to go along with the 50 million already donated. The shorter section means IF they can get this section funded and built then they can more likely get more donations for extending the park further north and south. Yeah I figured as much, and that makes complete sense. Thanks! quixomniac wrote: If anyone has better pictures than the DMN article, that would be much appreciated. The cross-section is all that was presented. I suppose we will see more in the future? Or have the "lakes"/ponds been dropped off all together? Is this Angela Hunt's re-wilding angle? I remember a D-Observer article mentioning two groups designing two different park concepts. I believe this is all we have been shown right now. Looks like there is a decent amount of info, but the text is too small to read, unfortunately. It sounds like the idea is to make most of the park wild, and atop the levees we'll see more man-made structures like playgrounds, performance spaces, cafes, etc..
You've got to wonder how solid their engineering and research if they believe the 1908 flood killed 5,000 and they are comparing the 30 foot levee height to the 52.6 foot Trinity River crest . . .
or maybe is it just sloppy writing and editing by D Magazine. Dekker, the environmental engineer from LimnoTech, walked through a history of the river—the city’s clear desire to “be one on the river,” with aspirations to grow. And then there was the 1908 flood, which killed 5,000 of the town’s 90,000 residents and destroyed millions of dollars of property. The flood led to city planner George Kessler’s plan for Dallas, which called for moving the river and straightening it so that it didn’t meander so closely to downtown. He also ordered it to be confined by 30-foot-tall levees to its east and west. They were completed in 1932. During the 1908 storm, the Trinity bulged to a depth of 52.6 feet and a width of 1.5 miles; a rain event that heavy has not happened since. If we get another rain event like 1908 I'd hate to think of what else could happen. That would put everything that was under water then under water again which would likely stretch all the way to Fort Worth. Not to even mention issues like the Lake Lewisville dam. The article criticizes the plan for being too artificial and likens it to 'six flags', which seems odd to me. From what I've seen, it seems like they are taking more of the 're-wild' approach, which is a really good thing. I know they mention some man-made structures, but, it seems like those would all be on top of or outside the levees, and the actual trinity river area would remain pretty wild. "So the total going in, even before the inevitable change-orders and elaborations, is $150 million to create a park on only 200 of the 10,000 acres that the city needs to manage one way or another." Everything that is being said could apply to the older rendering which feature the jugglers and rock climbing, but this new one seems to be a lot more reasonable. Then again, I was not at the event, nor have really seen much, in terms of detailed information on the park. Henry C Long wrote: You've got to wonder how solid their engineering and research if they believe the 1908 flood killed 5,000 and they are comparing the 30 foot levee height to the 52.6 foot Trinity River crest . . . When you are accounting for the crest total height, you have to also take into account that the river is now set below ground level to give it an extra ~20ft. so 20+30= 50? Thanks for the pictures, those are the ones I keep finding, but no newspaper thought of putting up decent resolution versions of them which makes most of their article useless if you have a hard time reading the diagram. I was hoping there was a city document somewhere so we can zoom in. But yes sometimes the Dallas Observer tries too hard to be the "cool cynical" newspaper. The diagram is much closer to re-wilding than 6 flags. They also mentioned at the event that the 1908 flood happened before the construction of the reservoirs around the city, which now control the volume of water flowing into the Trinity from the northern part of DFW. Prior to the construction of those, there was no buffer and all of the rain water would flow into the Trinity as quickly as it could, which contributed to the 52.6 foot crest. Besides, they are planning on expanding the actual river channel and adding some side river channels which will make flooding events less severe. There's no reason this man-made flood plane cannot become a primary component in the conditioning of potable water for the region. Rewilding this five-ish miles of river returns the natural filtration process to help clean the water. I've dreamed of a series of cisterns and catacombs under the flood plane to have handy ample water during the summer dry season and to rapidly channel flash flood excess downstream, but I understand that may cost too much (the cool factor would be off the chart, though). A critical system to all the various clean water rafting installations was pumping water upstream from the water treatment facility. That system should still be installed, but made two way -- multiple strategic intake station along the leveed river lead the flash flood water into gravity assisted pipes to a series of downstream wetland cells; the spring flooding excess is mostly contained until the summer drought at which point it is pumped back to the leveed section of the river and released when needed through collection of "Texas Sized" rain-shower water sprinklers that people can play in while the park is watered. I went to the event and brochures were available with all the text. casperitl wrote: I went to the event and brochures were available with all the text. Do you still have a brochure you can show us? Here's photos of the brochure. Thank you so much for doing taking those pictures! I'm really liking this plan, but, as with anything involving the Trinity, still highly skeptical. The plan for HSP was shot down by the Corps of Engineers. Back to the drawing board? Beginning of the end? Or what? The Balanced Vision Plan must be followed or the entire process must start anew. Will that happen? The sad thing would be that all the fanfare and renderings were foisted on the public as just a dream that won't become a reality. That has happened before and would be an unfortunate turn of events for a lot of people. [So. The Trinity park is delayed and deferred, yet again. The design by starchitect Michael Van Valkenberg was rejected by the U.S. Army Corps of Engineers because it doesn't comply with the Balanced Vision Plan -- the only federally approved design for the Trinity Park. Anyone who has been paying attention for the last decade. When Van Valkenberg's design was unveiled to great fanfare in May 2016, we said as loudly as we could: THIS DESIGN WILL NOT BE APPROVED BY THE CORPS. IT DOESN'T FOLLOW THE BALANCED VISION PLAN. PLEASE STOP REDESIGNING THIS PARK AND LET'S START BUILDING IT, NOW. We were ignored (again). Poopooed (again). Told we weren't visionary enough (again). Trust us, they said. The design is amazing and we won't have any problem with approvals. How can we possibly go wrong with all these fancy people nodding their heads in unison with us? they said. Enough. They were wrong, they are wrong, and they will never, ever be right about the Trinity. We must stop listening to them and start listening to people who understand the Trinity and who aren't holding their hands out. 1. Fire everyone at the city who has kept this hamster wheel turning. Fire every single one of them who has championed this repetitive and unnecessary redesign process and allowed money to flow from our city coffers, from the purses of benefactors, to flow, flow, flow into the pockets of consultants and engineers and starchitects from distant lands whose singular and sole purpose is to become enriched at the expense of our Trinity Park. Fire the people who keep recommending the Van Valkenbergs, the Brent Browns, the people who benefit from our park's non-existence and repetitive deferral. Fire them all. And this corollary: No one who has ever had anything to do with failed Trinity schemes needs to ever say another word about the Trinity Park. Find a new job. Get a new hobby. Move along. 2. Terminate the city's contract with the Trinity River Local Government Corporation. 3. Disband the Trinity Park Conservancy nee Trinity Trust. 4. Stop asking the architect for the Dallas Morning News to opine about anything related to the Trinity. What does a park have to do with architecture? Ask Robert Wilonsky. Talk to Jim Schutze or Peter Simek. Get Sam Merten or Kevin Sloan to write something. See what Ben Sandifer thinks. Let the public be educated by people who have demonstrated a thorough knowledge of this complex project. 5. Stop redesigning the Trinity Park. We've got the foundation. It's called the Balanced Vision Plan. It's far from perfect. It's got some dumb stuff in it. But it's the only federally approved plan for the Trinity Park we've got and we can work with it. 6. Engage naturalists, botonists, Blackland Prairie habitat experts, biologists, wildlife experts, people who live and breathe the Trinity. Don't just invite them to the table. Give them the table. 7. ReWild the Trinity. Maybe I stuttered. Maybe my mic's not on. REWILD THE TRINITY. Use the Balanced Vision Plan as the physical foundation and layer rewilding on top of it. Build the access points and parking areas and trails envisioned by the BVP. Ignore the lakes. Remove invasive species. Bring back Blackland Prairie. We will have the largest urban nature park in the country, in the heart of our city. It will be amazing and it will be cheap and it will be fast. REWILD THE TRINITY. This is not the slightest bit surprising to any of us who pay attention to the Trinity. If you read this page, you've seen me say dozens of times that the Van Vakenberg plan was unbuildable under Corps regulations, would wash away in a flood, and violated Belgian neutrality. The only reason the LGC was formed to push the Van Valkenberg plan was that the Mayor "needed a win" on the day we killed the Tollroad. If you live in Districts 3, 4, 5, 8, 10, 11, or 13, your current representative on the council voted to give him that "win." Guess what. Mayoral candidate Mike Ablon for Dallas Mayor in his year and a half as chair of the LGC managed to raise no money for this terrible plan despite having a $50mm match from the Simmonses. What a win. The LGC is a joke. The VV plan is a joke. And it was all so predictable. I agree, fire the jerks who keep pushing the crap.